Show Alert: RRIICCEE @ Jensen RecCenter Studio - This Saturday! If anyone is still in town this weekend with little to do on Saturday night, or if you're a fan of either the intriguing Vincent Gallo or co-founder and former Hole guitarist Eric Erlandson, or if you want to be surprised, then we've got just the show for you! Gallo and Erlandson (plus others, I think) are going to stop by Echo Park's Jensen RecCenter Studio "hoping to avoid musical cliché or jamming" by "composing and performing at the same time". Apparently Gallo doesn't like to apply the term "improv" to RRIICCEE, but they are definitely not going to be performing pre-written music. Gallo contends that a recording "is only evidence of that creative moment" with the purpose of listening "enjoyment". OK, Vinnie, what's the purpose of a live show? Guess we'll find out Saturday. Show is at 8:00 in the p.m. Map here. You can get tix here. 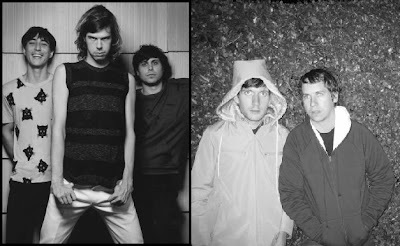 Ok, I know February '08 seems like a long way off, but you better quickly grab tix for what will surely be an unpredictable evening of music with Liars and No Age at The El Rey. Opening that night are L.A.'s own No Age, whose compilation Weirdo Rippers collects the duo's infectious, sloppy, DIY tracks. I just love these guys. Listen to "Neck Escaper" here. And, before fees, tickets are only $15! Woo-hoo! Reminder: The Republic Tigers @ Spaceland - TONIGHT, 12/19/07! The boys have been in L.A. mixing their L.P. with Mark Needham, and the E.P. 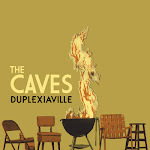 is out now on iTunes. (It was actually on the "What's Hot" homepage. Woo-hoo!) Pick it up for under $4. The Tigers also hit up Jonesy's Jukebox last week, but there's not a full archive of that. Here's some live footage, but expect things to be a few notches above that...just trust me. See you there! I'll be the guy in the green gray shirt with a sailboat on it. 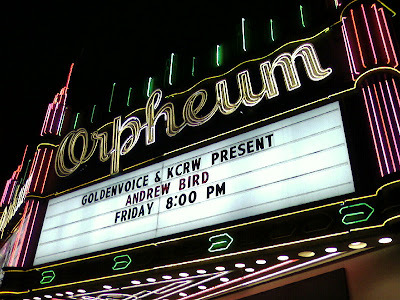 I caught the incredible, multi-talented Andrew Bird last Friday at LA's beautiful Orpheum Theatre. Joined by DJ KRC (who only a day earlier had booked a flight from SF for a less-than-24-hour jaunt), we grabbed a cold one from the lower-level Tavern and quickly found our spacious Mezzanine seats. Bird took the stage a short time later dressed in a three-piece suit with shoes that he kicked off barely into the first song, apparently to better manipulate his pair of DL4s. He then proceeded to play a solo set showcasing his chops: bowed and plucked violin, vocals, guitar, world-class whistling and, of course, looping. After wowing the hushed audience for almost 25 minutes, Bird was joined by Jeremy Ylvisaker on guitar/bass and Martin Dosh (of Anticon fame) on drumkit, keys and additional looping. DJ KRC and I had seen Bird's performance at Coachella, but this time he bumped things up -- way up. The whole set clocked in at an hour and forty minutes with full and extended selections from throughout his catalog. Fans of Weather Systems, The Mysterious Production of Eggs, and Armchair Apocrypha would not have been disappointed. And (t)he(y) pulled off the tracks with a level of musicianship that people aren't lucky enough to frequently experience. There's still time to catch the remaining U.S. dates, but you'll have to go Anzac to see Bird anywhere else. Right-click, "save link as" the below tracks from the performance. Pics from Losanjealous too. 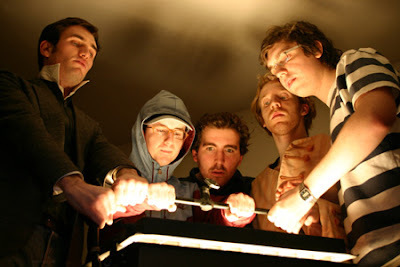 Hot Chip are playing The El Rey on Monday, February 4, 2008, one of only two domestic dates in the foreseeable future. The presale is underway RIGHT NOW. Here's the password: shakeafist. Good luck!